First Impression: A very impressive presence – a nice aroma, good head and rich flavor. Aroma is bitter, coffee, and roasty. Visuals are an inky black body topped with a tan head that is persistent and lacy. Taste is thick with espresso notes, licorice, and pepper. Palate is perhaps its downfall – a bit weak, with a medium finish. 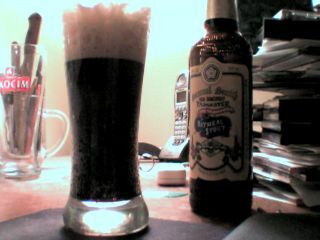 Second Impression – not anything close to a Yeti or a Shakespeare, but not a bad stout – far surpasses a Guinness. But for $4.50 a 12 oz bottle, I’d much rather have the Yeti. First Impression: Aroma is sweet cocoa, coffee, and mold. Visuals deep black with a long lasting head. Taste coffee, some hops, nice depth and flavor. Palate dry with a short finish. Second Impression a very nice stout, and a great way to celebrate my birthday. First Impression: Typical brown ale, which is surprising, considering Nogne 0 and Canal’s in Burlington. Aroma is faint and a bit chocolate. Visuals are clear carbonated and brown with a very persistent head but no lace. Taste is simple, average brown ale – good hop depth, simple taste signatures. Palate is a medium finish and a hoppy bite. Second Impression – about average for a brown ale, and surprisingly, better examples exist outside of Nogne 0’s offering here. Notes: One of the best aromas I’ve encountered – fills the room. Notes: One of the best head retentions I’ve seen in quite some time. Lacing is remarkable. Color is deep and very good looking. Body is not perfectly clear, but I imagine that’s by design. There is no mention of bottle conditioning. Notes: quite spicy – could stand up to the most potent foods and flavors. Notes: The finish is superb. 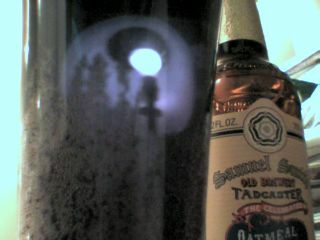 The carbonation is present and active. The mouth is affected and warmed all over. Notes: One of my all time favorite beers – remarkably drinkable, smooth, bitter, sweet, and tasty. Beautiful to behold, and nicely crafted. Aroma is enticing. Price is reasonable for the product, and the finish keeps you interested. A superlative beverage.